It has been 70 years since Israel declared its independence. So this year, the Israeli Film Festival of Philadelphia (IFF) will showcase films that highlight different aspects of the region’s history. The movies will be shown at various locations in Philadelphia and the nearby suburbs from March 3 to March 25. The Israeli Film Festival of Philadelphia (IFF) is celebrating an important milestone from March 12 through April 3, 2016: two decades of showcasing the best movies from Israel and the Middle East. The IFF is the only independent non-profit Israeli film festival in the country. What started as a passion project has grown into an eagerly awaited cinematic occurrence. In honor of the IFF’s 20th anniversary season, Giovani’s Bar and Grill, at 15th and Chestnut Streets in Center City, has concocted a dish called the Israeli “Big Picture” Shakshouka. For every platter ordered, which includes pita and Israeli chopped salad, the restaurant will make a donation to the film festival. Shakshouka, a traditional Mediterranean dish, is made up of a spicy tomato sauce with the Middle Eastern herb and spice blend za’atar. The dish also contains paprika, parsley, garlic, feta, olives, onions, hot peppers and of course, perfectly poached eggs. Simon Atiya, his brother Ami and his brother-in-law Haim Atias have been running Giovani’s for more than a decade, and are excited that Israeli cuisine is finally catching on. The Israeli Film Festival of Philadelphia will mark its 18th year Saturday, March 8, with a screening of the comedy “Hunting Elephants” and a gala dessert reception at the University of Pennsylvania’s International House. The movie features Sir Patrick Stewart, joining Israeli acting veterans Sasson Gabai and Moni Moshonov in a cinematic romp in which three elderly men and a young teenager decide to rob a Jerusalem bank. On Sunday, March 9, the International House will offer three movies. First at 2:30 p.m., “Hunting Elephants” will be screened again. Full event list after the jump. Then at 5 p.m., the documentary “Sharon” will be shown. Director Dror Moreh, of Oscar-nominated “Gatekeepers” fame, created this film in an attempt to understand how the late prime minister, with a reputation for hardline policies, could also be the architect of the withdrawal of Israeli citizens and soldiers from Gaza. His riveting film combines unique private moments from home movies, archival footage from his public life and interviews with companions from the past decades to create a portrait of the military leader and statesman. “Sharon” will be followed by a falafel dinner. The day will conclude at 7:30 with the screening of another documentary, “Special Interview.” This movie follows two young Israeli adults with learning disabilities in their quest to interview President Obama. While they have already interviewed many well-known personalities, it is their deepest dream to meet the President. Viewers will go along on their journey to fulfill this dream and get a glimpse into their unique world. The Israeli Film Festival of Philadelphia will mark its 17th year next month, March 2-17. The aim of the festival is enriching the American vision of Israeli culture and society through film. A slate of feature films and documentaries were selected with a goal of providing a diverse and impartial reflection of Israel. The program includes feature films, dramas, comedies and documentaries that are award-winning and have received wide recognition both in Israel and abroad. Click on each event for more details and a trailer. An addition to this year’s Israeli Film Festival of Philadelphia was a showing of the 2007 film, The Band’s Visit , followed by a Q&A with the director, Eran Kolirin. It was held on April 15 at the new home of the Jack M. Barrack Hebrew Academy in Bryn Mawr. The film is a bittersweet account of what happens when the Alexandria Ceremonial Police Orchestra mistakenly heads to the remote fictional desert town of Bet Hatikva, where there is no Arab Cultural Center (“no Arab Cultural Center, no Israeli culture, no culture”) to stage their concert performance. They are stranded there, with little Israeli money, until the inter-city bus arrives the next day. Despite the tension between their two countries, they’re greeted with a range of generous and grudging hospitality. More including trailer after the jump. The Band’s Visit won eight Israeli Ophir Prizes awarded by the Israeli Film Academy. Rotten Tomatoes reported that 98% of critics gave the film positive reviews, based on 108 reviews, and gave it a golden tomato for best foreign film of 2008. Deborah Baer Mozes, the cultural attaché for the Israeli embassy, started the Q&A by asking what was the director’s inspiration? It was the character of the Egyptian “General” (Lieutenant-Colonel Tawfiq Zacharya, superbly played by the Iraqi Jew, Sasson Gabai) dealing with his inner turmoil, of “something underneath trying to escape.” Another audience member asked about his inspiration from the Egyptian playwright, Ali Salem, whose “My Drive into Israel” was a memoir of his 1994 trip to Israel following the signing of the Oslo Accord. Salem later described the trip as not “a love trip, but a serious attempt to get rid of hate. Hatred prevents us from knowing reality as it is.” His pro-peace sentiments were controversial and Salem was banned from publication in Egypt afterwards. An audience member asked why could the characters make phone calls from the public telephone booths without any simonim (Israeli phone tokens)? The director gave both a practical and a poetic reply: the “142” number sequence allows one to make a collect call without simonim, but it’s far easier to make a phone call without money than to send an Egyptian band to Israel. Another audience member noted that the filming was done in Yeruham (a desert town in the northern Negev, about 15 km from Dimona). Kolirin has a fondness for these towns, which were planned to expand settlement into the desert, but which became dismal, forgotten places. He expressed nostalgia for their architecture, which are gravestones to a grand idea. How was The Band’s Visit received in the Arab world? It was banned, of course, but it did get one screening in Cairo and Kolirin travelled there as the guest of the Israeli embassy. It was a “schizophrenic feeling” for him, as it is a country so much like his own, but still foreign. An audience member asked about the choice of having some characters being changed by the band’s visit, but Kolirin and other audience members disputed a change, as in whether the Egyptian character Simon completed his concerto overture. The director said that he was more interested in a change in perspective (including that of the viewer, as in the phantom girlfriend who actually does make a phone connection) than for any external change. 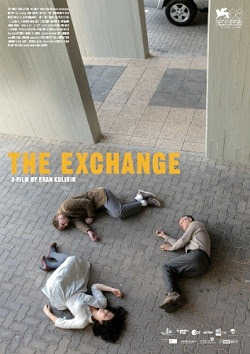 Kolirin’s second film, The Exchange, was shown at the 68th Venice International Film Festival last September and will be released in the United States later this year.